These are both well-known manufacturers of audio interfaces and they certainly deserve some recognition. First of all, Focusrite stands for high-quality music products like Scarlett Solo audio interface, and they tend to enrich people’s lives through music. We can safely say that this manufacturer surely is responsible for many great audio interfaces besides Scarlett Solo. On the other hand, we have a Steinberg that is able to provide some of the best audio interfaces. They are enabling people to express themselves through music and creativity. In other words, they tend to be the first choice for people that are interacting with sound and music. 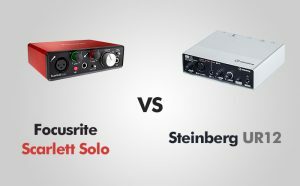 So, let’s begin with Scarlett Solo vs Steinberg UR12 comparison. Let’s see everything that you need to know in order to decide which one to pick. When it comes to sound quality and performance, Scarlett Solo surely is one of the best choices on the market. Anyhow, this audio interface is equipped with high-quality mic preamp and some newly-designed instrument input. In that light, it is safe to say that you really could benefit a lot from this audio interface. On the other hand, this audio interface includes pro tools like creative pack and Ableton live lite, Softube time and tone bundle, and more. And to top it all off, the Scarlett Solo audio interface is compatible basically any operative system like Windows 7 or higher, and Mac OS X. That being said, let’s see the main features and specifications of Scarlett Solo. Since this audio interface is designed to handle hot guitar pickups, you can only imagine the variety of features that are equipped on Scarlett Solo. Namely, there is a stereo line output that will allow you to connect to home speakers or headphones. Also, the variety of pro tools like Focusrite’s red plug-in suite, Softube Time and Tone bundle, and 2GB of Loopmasters samples, will surely come quite helpful when it comes to music. With the frequency response from 20 Hz to 20 kHz, Scarlett Solo delivers only the best sound quality with the variety of options when it comes to tones and melody. This means that this audio interface will surely be quite convenient for seriously hot guitar pickups and a little bit harder stuff. On top of it all, Scarlett Solo supports sample rates from 44.1 kHz, 48 kHz, and up to 192 kHz. As for the value and price ratio, we can say that Scarlett Solo surely is one of the most valuable audio interfaces on the market. Simply speaking, this audio interface holds massive value for the cash and it offers plenty of benefits for anyone. The price might be a little bit higher than expected, but after all, you are paying for the best possible audio interface in this price point category. The competitor Steinberg UR12 will definitely make you think twice before deciding which audio interface to get. Namely, this audio interface is equipped with many different features that you can clearly benefit a lot from. Also, the compatibility with other devices will allow you to use Steinberg UR12 in the best possible way. Furthermore, there are some possibilities that Steinberg UR12 is offering which will definitely increase its performance and sound quality in general. The USB-powered feature will ensure that you can connect to Mac or any other device you like. Never the less, let’s discuss the most important features and specifications of Steinberg UR12 audio interface. First of all, this audio interface is a 24-bit model that is able to work on 192 kHz frequencies. This means that you will be able to experience really good sound quality and variety of tones with this audio interface. Also, there is a 1 Class-A D-PRE microphone preamp that supports +48V phantom power. Besides that, the Hi-Z instrument input surely will enable you to use this audio interface for many instruments and enjoy the quality of sound. Also, there is a cross-platform which allows this audio interface to be compatible with Windows, OS X, and iPad. When it comes to sound quality, this one surely brings a new touch which ensures only the most awesome sound quality with a variety of tones. Anyhow, with everything that is equipped on this audio interface, you will be able to experience and see what a true quality of sound actually is. The overall value for the price of this audio interface is quite amazing as well. You can actually save a little bit of money if you get this one, but, you won’t lose on the quality and performance. In other words, Steinberg UR12 is one of the most valuable audio interfaces on the whole market. It has lots of benefits to offer and the price is actually not that high. Performance Evaluation – what makes Scarlett Solo and Steinberg UR12 different? As we can see, both of these audio interfaces are quite good when it comes to frequency response. The Scarlett Solo is a bit better though since it is able to work on different frequencies. On the other hand, Steinberg UR12 works only on 192 kHz frequency. Anyhow, we can conclude that the Steinberg UR12 is specialized for only one frequency and it performs greatly there. And, the Scarlett Solo is great on every frequency response equally. You can actually use both of these audio interfaces with a variety of other devices. However, Steinberg UR12 has a bit better compatibility since it is equipped with more USB ports and it supports iPad as well. The Scarlett Solo works great with lots of devices too, but it isn’t compatible with the same number of devices as Steinberg UR12. In the light of everything we said above, it is easy to conclude that both of these audio interfaces are quite good and they both hold pretty good value for the cash. However, Scarlett Solo is a bit better when it comes to frequency range and response. On the other hand, Steinberg UR12 is definitely the choice if you work with different devices that this audio interface supports.